The complete guide to help the understanding of the continuing, changing St. Emilion classification of its wines. The wines of Saint Emilion, as you probably know by now received their most recent classification, September, 2012, While it looks difficult to comprehend at first, especially for American wine buyers, as they do not correspond to the famous 1855 Bordeaux Classification, they are easy to understand and follow. There are four levels in the St. Emilion classification of its wines, Premier Cru Classe A Premier Grand Cru Classe B, The Grand Cru Classe Wines from St. Emilion and Grand Cru. The Premier Grand Cru Classe Classification of St. Emilion are the First Growths of St. Emilion. Those chateaux are divided into two categories, Premier Grand Cru Classe A, of which there are only 4 chateaux entitled to use that designation and Premier Grand Cru Classe B, of which 15 estates are allowed to use that wording on their label. The next level of Grand Cru Classe has a total of 63 estates in that classification. The level of quality and consistency varies widely in the Grand Cru Classe level of the Saint Emilion classification. In my view, some of those estates at the Grand Cru Classe level could be elevated to the level of First Growths, while there are numerous chateau that do not perform at the same level as the best wines with Grand Cru Classe status. There is a big difference in the level of quality for wines with that level of St. Emilion classification. If the judges were unwilling to recognize the difference, they should have two levels of Grand Cru Classe status in the Saint Emilion Classification. At the end of the day, the market knows the difference. There are wines in the same level of classification selling for perhaps 20% of the price of the top wines in the same Saint Emilion classification. The final, lowest level in the St. Emilion classification system is Grand Cru. Wines bearing the Grand Cru designation did not earn that level of Saint Emilion classification for the level of quality found in their wines. To be a St. Emilion Grand Cru winery, a property must abide by the rules and regulations of the St. Emilion appellation and be located within the borders of the land that has been classified as being of Grand Cru quality, also known the appellation of Saint Emilion Grand Cru. While wines bearing the Grand Cru designation could be as good as Grand Cru Classe, or even Premier Grand Cru Classe wine, as every St. Emilion chateau is not classified. Generally speaking, wines at the Grand Cru level are not as good as the 81 wines included in the St. Emilion classification. Examples of top Saint Emilion estates that have chosen not to be classified are Tertre Roteboeuf and Chateau Le Dome. Both are outstanding wines with the simple designation of St. Emilion Grand Cru, and they are also are among the most expensive wines made in St. Emilion. Currently, there are more than 200 St. Emilion Grand Cru producers in the appellation. The remaining vineyards in the region are classified as simply Saint Emilion, because they come from the lesser terroir located in the St. Emilion appellation, and not the Saint Emilion Grand Cru appellation. The results of the 2012 St. Emilion classification have confused consumers. They are not sure how the results were arrived at. To help with an easy way to understand what took place in a nutshell, the following criteria was used to come up with the results of the 2012 Saint Emilion Classification. For chateaux seeking Premier Grand Cru Classe status in the St. Emilion classification, they were required to provide samples of the previous 15 vintages. For chateaux seeking Grand Cru Classe status in the St. Emilion classification, they needed to provide samples of the previous 10 vintages. While the wines were the most important part of the 2012 St. Emilion Classification, the chateaux were not judged solely on their wines. Other factors came into play. Plus, all things were not equal, the level of what each layer was worth changed, depending on the level of St. Emilion classification sought by the chateau. For the life of me, I cannot understand why for example, the importance of the wines varied depending on the level of classification. At least to me, the wines from each Saint Emilion chateau should be the most important factor for the level of classification. Perhaps, that’s why the market and its decision is what matters the most. For chateaux seeking Premier Grand Cru Classe status, the wines were only 30% of their total score, while estates hoping or Grand Cru Classe, the level of wine was more important as that was deemed to be 50% of their total score. For the recent St. Emilion classification, the Chateaux were also judged on their reputation in the marketplace. Once again that varied. For estates seeking Grand Cru Classe status, that was only worth 20% of their score, while that was a much more important criteria for Premier Cru Classe status, as that weighed in at 35% of their final score. The terroir was also a factor along with the estate in the recent Saint Emilion classification. Once again the weighting was different for Grand Cru Classe, versus Premier Cru Classe status. The terroir and soil of St. Emilion, and the estate was a much more important consideration for Premier Cru Classe status than for Grand Cru Classe. The terroir factored in at 30% for Premier Cru Classe and 20% For Grand Cru Classe in the recent Classification of Saint Emilion. Last, and least, the estate and practices were also a part of the consideration in the current St. Emilion classification. For Grand Cru Classe status, that came in at 10% of the score, while it was only worth 5% of the score for Premier Cru Classe status. 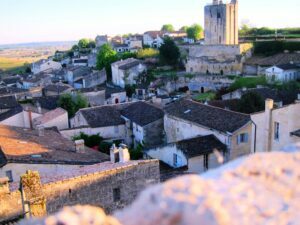 With all these facts, numbers and figures floating around, Classified estates are in the minority in St. Emilion. As a reasonable guess, wines in the St. Emilion Classification at best count for about 15% of the production of the entire St. Emilion appellation. Scores were awarded on a 20 Pt scale to estates based on the above mentioned criteria. For For Premier Grand Cru Classe A status, chateau had to reach at least 17/20 Pts, for Premier Grand Cru Classe, a property needed to score, at least 16/20, Pts, for Grand Cru Classe, an estate needed a minimum of 14/20 Pts. To become Grand Cru Classé, chateaux had to score at least 14 out of 20, to become Premier Grand Cru Classé, at least 16 out of 20. Several vineyard changes took place with the 2012 St. Emilion classification. Chateau Magdelaine was absorbed into Chateau Belair-Monange. Chateau Bergat was added to Chateau Trotte Vieille. Chateau Cadet Bon was merged into Chateau Soutard. La Tour du Pin was annexed into Chateau Cheval Blanc and Chateau Angelus was also allowed to add a few more hectares of vines to their estate. On the other side of the coin, Valandraud agreed to remove some hectares of vines that were not deemed suitable for Premier Cru Classe B status. September 6, 2012, the official results of the new, St. Emilion Classification were released. The 2012 St. Emilion Classification became official in November, 2012, when it was certified by the French government. The classification is now etched in stone and cannot be changed for 10 years. In January, 2013, three producers filed a suit seeking to have the 2012 St. Emilion Classification amended. Chateau Croque Michotte and Pierre Carle led the charge, which was followed by Chateau Corbin Michotte and Chateau La Tour du Pin Figeac. The basis behind the suit was a clam about errors in the process, supposedly based on uncovered minutes from meetings about the classification. In March, 2014, author Isabelle Saporta published “Vino Business.” The book stated the 2012 St. Emilion Classification was fixed. Among her claims were the larger chateaux were able to fix the criteria for what was needed to retain their higher levels of classification. She added that some critics were paid thousands of Euros for better scores and comments. Hubert de Bouard, the owner of Chateau Angelus, which was upgraded to Premier Grand Cru Classe A was personally targeted in the book. Within days of being published, Hubert de Bouard filed a suit of libel and defamation of character. de Bouard was not successful in his suit. In December, 2015, just a few days before Christmas, the French, Bordeaux Administrative Court dismissed the law suit and legal challenge brought by the 3 chateau. While the legal efforts to derail the classification might continue, and actions could be taken against Hubert de Bouard and Philippe Castaja for conflicts of interest and undue, overreaching of power and influence. Not being satisfied with the results, the same 3 chateaux helped bring about another investigation in October 2018 against Hubert de Bouard and Philippe Castaja for similar charges in French criminal courts. Personally, I’d be surprised if anything came from it, as it’s my understanding that all chateaux seeking classified status agreed that all decisions were final. The French court once again certified the 2012 St. Emilion classification which probably allows little room for suits. While the classification matters when it comes to land values, the truth is, the market sets the price for the wine. Classified wines do not always sell for more than unclassified wines. We’ll need to wait and see what happens. It will be interesting to see what takes place in 2022 when my guess is, the next official Saint Emilion classification takes place. This is the complete list of 81 chateaux that earned classification status in the 2012 St. Emilion Classification. The St. Emilion classifications are based on soil, terroir, a tasting of the wine, the wine making facilities, efforts at promotion and the reputation of the vineyard. The system worked reasonably well until the most recent reclassification from 2006 was slated to be certified. March, 2007, The Bordeaux administrative council suspended the classification based on the claims and suits filed by four Bordeaux wine properties that had been demoted. The four chateau filing the suit were: Chateau La Tour du Pin Figeac, Chateau Cadet Bon, Chateau Guadet and Chateau de la Marzelle. The basis of their suit was the results were discriminatory, because not every property was visited personally by the 12 member St. Emilion Commission. In late 2007, France’s highest administrative court lifted the suspension of classification allowing the previously agreed changes to appear on the labels for the 2006 vintage. However, while the results of the 2006 St. Emilion classification are now official, the 4 excluded estates that brought the suit had the right to appeal, and did. Their suit was not successful. But a reclassification was ordered to take place in 2012. How did the St. Emilion classification come into existence? St. Emilion was omitted from the 1855 classification. As a result, The region’s Syndicat Viticole started planning the St. Emilion classification back in 1930. But it was not until October 7, 1954 that the principles behind the classification became official when the INAO agreed to take responsibility for handling the classification. The first list of classified wines from St. Emilion was published on June 16, 1955. The original St. Emilion classification was amended on August 7 and October 18, 1958. The debut list contained 12 Premier grands crus classés and 63 Grands crus classés. The local Wine Growers’ Union planned on having the classification revised every ten years, to keep it from becoming rigid or outdated. Although this is not happening on schedule, it has been revised several times, most recently in 2006. But in 2006, things did not go exactly according to plan, as you have read. It is interesting to note, that while classification status matters in France, with the exception of the “Premiere Grand Cru Classe A” wineries, consumers do not pay much attention to who has what classification. Numerous Grand Cru Classe Chateau and even unclassified wines sell for more than some Premiere Grand Cru Classe wines these days. Today, more than ever, consumers are more focused on what is in the bottle, than with what is on the label according to the St. Emilion classification. •Chateau La Clusiere was merged into into Chateau Pavie. •46 Saint-Emilion Grands Crus Classés.